New York-based company Strong America Ltd., has announced a recall on specific packs of Chinese Wolfberry products. The recall is being done on the product because it has been found to contain undeclared sulfites. The problem was discovered after results of a routine sampling showed the presence of undeclared sulfites in the samples that were being tested. The sampling was done by Market Food Inspectors and the state’s Department of Agriculture. The company immediately issued a recall after being informed of the problem. 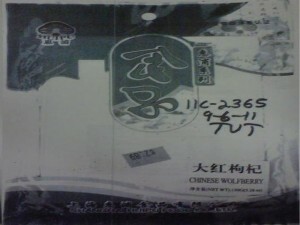 Strong America is currently recalling all packs of its Chinese Wolfberry. The product is sold under the Huipo brand, packed in transparent plastic and has a net weight of 5.28 ounces. The recalled product has been distributed to food retail stores in Queens, Manhattan, Brooklyn and Albany, in New York State. Sulfites are considered an allergen. Consumption of at least 10 milligrams of this substance can trigger an allergy attack, especially in people with a hypersensitivity to it. In worst cases, this allergy attack could turn into something more serious and more life threatening. Anaphylactic shock could happen to a person who consumed 10 milligrams or more of sulfites. To avoid any health emergencies, it is always important to include sulfites (or any other food allergen) in the list of ingredients, if they are present in the product. Consumers who have bought the recalled Chinese wolfberry product are advised to return it to the store where they bought it. They will be given a refund. For questions or concerns about the product recall, consumers may call Strong America at 718-628-6200.